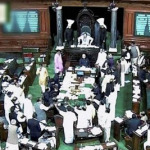 New Delhi: Lok Sabha on Tuesday, the first working day of parliament’s winter session was shaken as several opposition parties tried to corner the government over the black money issue. As soon as the house met for the day, Trinamool Congress (TMC) members went near the speaker’s podium with black umbrellas raising slogans on black money. They were joined by members from Janata Dal-United, Congress, Rashtriya Janata Dal (RJD), and Samajwadi Party who also raised slogans demanding a response from Prime Minister Narendra Modi as to when the black money would be brought back. 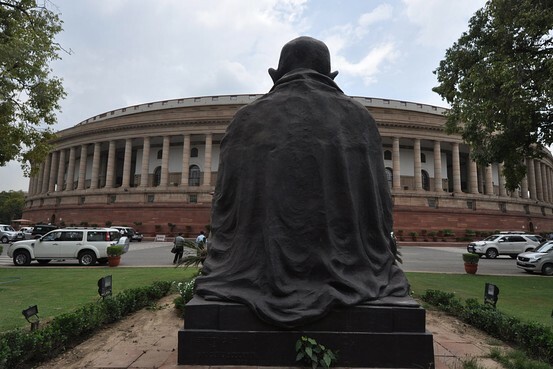 When Speaker Sumitra Mahajan did not agree to this, they moved near the speaker’s podium carrying black umbrellas with ‘Kaala Dhan Waapas Lao’ (Bring back black money) written on them, forcing her to adjourn the house till noon. When the house met again at noon, work resumed amid din. While opposition members continued to raise slogans, papers were presented and even matters of urgent public importance were taken up by the house. 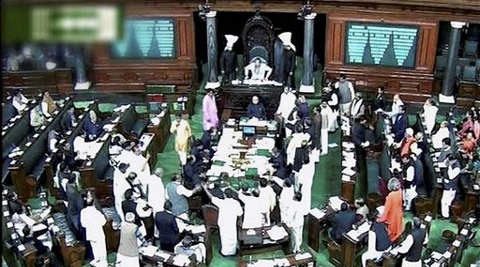 TMC members were also seen raising slogans in the Rajya Sabha. A notice for suspension of the question hour to take up the debate on black money was also given in the upper house. Earlier, TMC members were seen staging a protest outside parliament. They were joined in the protest by SP, JD-U and RJD leaders. ‘Modi government promised to bring back black money in 100 days, almost 200 days are over, they must give an answer now,’ said TMC’s Sukhendu Sekhar. ‘Black money was one of the key poll planks in the Lok Sabha elections on which the BJP won, but the government has done nothing on this count since it came to power. We want a threadbare discussion on this,’ said JD-U leader K.C. Tyagi, who gave the notice for discussion to the Rajya Sabha Chairman on behalf of his party.